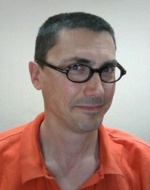 Stephen Bosi has been an academic at the University of New England since 2012. His scientific career began at UNSW where he completed a BSc with a double major in physics and chemistry (Honours in chemistry) and a PhD in condensed matter physics (crystal growth and properties of superconducting yttrium barium cuprate). He spent roughly a decade conducting research in optical and electronic phenomena, especially solar energy & sustainable technology at UTS, ANSTO and USyd. At the Radiation Oncology Dept, Prince of Wales Hospital, Sydney, he conducted four years of medical physics research (including 3‑dimensional dosimetry and CT scan reconstruction algorithms). He has also lectured in physics at WSU (Macarthur), University of Wollongong, UTS Broadway and University of Sydney. He is distracted from his teaching and research duties by educational and public science presentations, including appearances on ABC Radio and TV. He was the joint-lead author of the series of high school physics textbooks, "In2 Physics @ Preliminary" (2009) ISBN 9780733989445 and "In2 Physics @ HSC" (2010) ISBN 9780733991738, Pearson Australia. Davies J.B., Bosi S.G. and Baldock C., A genipin-gelatin gel dosimeter for radiation processing, Radn Phys, Chem. 81 1263–1265, 2012. Bathgate S. N. and Bosi S.G., A robust convection cover material for selective radiative cooling applications, Sol. Energ. Mat. Sol. Cells 95 2778–2785, 2011. Bosi S.G., Naseri P. and Baldock C., Light scattering-induced artifacts in a complex polymer gel dosimetry phantom, Appl. Opt. 48 2427-2434, 2009. Bosi S.G., Brown S., Sarabipour S., De Deene Y. and Baldock C., Modelling optical scattering artefacts for varying pathlength in a gel dosimeter phantom, Phys. Med. Biol. 54 275-283, 2009. Bosi S.G., Hayes J., Large M.C.J. and Poladian L., Colour, iridescence and thermoregulation in Lepidoptera, Appl. Opt. 47, 5235-5241, 2008. Bosi S.G., Naseri P., Puran A., Davies J. and Baldock C., Initial investigation of a novel light-scattering gel phantom for evaluation of optical CT scanners for radiotherapy gel dosimetry, Phys. Med. Biol. 52, 2893-2903, 2007. Shrier O., Khachan J. and Bosi S., A Markov chain approach to modelling charge exchange processes of an ion beam in monotonically increasing or decreasing potentials, J. Phys. A: Math. Gen. 39 11119-11128, 2006. Shrier O., Khachan J., Bosi S., Fitzgerald M. and Evans N., Diverging ion motion in an inertial electrostatic confinement discharge, Phys. Plasmas 13, 012703, 2006. Buie D., Dey C.J. and Bosi S., The Effective Size of the Solar Cone for Solar Concentrating Systems, Solar Energy 74 417-427, 2003. Khachan J., Moore D. and Bosi S., Spatial Distributions of Ion Energies in an Inertial Electrostatic Confinement Device, Phys. Plasmas, 10 596-599, 2003. Large M.C.J., McKenzie D.R., Parker A.R., Steel B.C., Ho K., Bosi S.G., Nicorovici N. and McPhedran R.C., The Mechanism of Light Reflection in Silverfish, Proc. Roy. Soc. Lond. A 457 511-518, 2001. Bosi S.G., Beard G.E., Moon A.R. and Belcher W.R., Microwave Preparation of the YBa2Cu3O7‑d Superconductor J, Microwave Power 27 75-80, 1992. Bosi S.G., Puzzer T., Russell G.J., Town S.L. and Taylor K.N.R., Large Single Crystals of YBa2Cu3O7‑d Superconductors from Chloride Fluxes, J. Mater. Sci. Letts 8 497, 1989. Khorasani A.N., Taylor K.N.R. and Bosi S.G., The Relationship between the Twin Structure and Optical Domains in Single Crystal YBa2Cu3O7‑d. J. Cryst. Growth 98 461, 1989.